Star Wars Blu-Ray Friday !!! 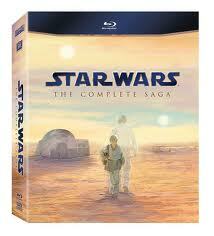 Friday, September 16 is the release of the Star Wars Trilogy on blu-ray. This is another historic milestone in the history of Star Wars and just wanted let everyone know I will be getting it and hope to review the movies (with the new changes) over the weekend. I was thinking about this though and am unsure of the order that I wish to watch these in. The order changes the entire focus of the saga. If I watch them in the order they originally aired then it is the story of Luke Skywalker and his life. If I watch them in the order of movie timeline then it is the story of Anakin Skywalker and his redemption. This is an important decision and I am looking for help. 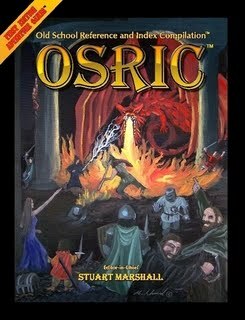 You heard us say that Dust Tactics was a good game and we of KGS really enjoyed playing it ...Brian and I so much so that we ran a campaign a few months ago. The one big limiting factor I found was that it was total tile based...NO LONGER! DUST Warfare moves our beloved game onto the table. This is being brought to us from, none other then, Andy Chambers. Many of us know him as a long time contributor to some of Games Workshops most famous titles. He is also one of the lead designers for Mongoose Publishing's Starship Troopers game while being the creative director of Blizzard Entertainment, they own World of Warcraft (Okay, I guess I can overlook the whole WoW thing). Allied Captain Joseph Brown looked out the window of his building at the devastated streets of Scapa Flow beyond. Smoke and fire issued from the battered husks of buildings. 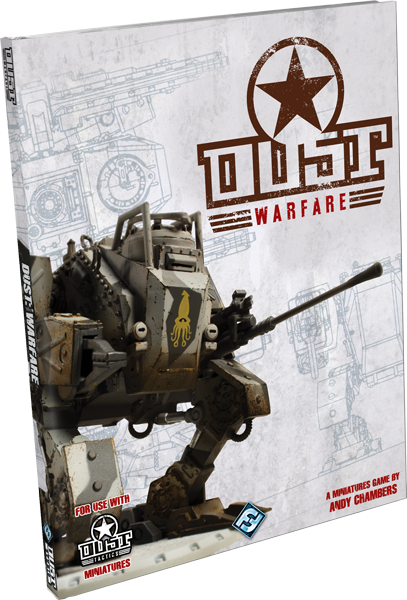 Fantasy Flight Games is excited to announce the upcoming release of Dust Warfare, designed by renowned miniatures guru Andy Chambers! Our intent to launch a Dust tabletop miniatures game was announced even before Dust Tactics was released. Now the success of Dust Tactics has paved the way for us to take the next step. 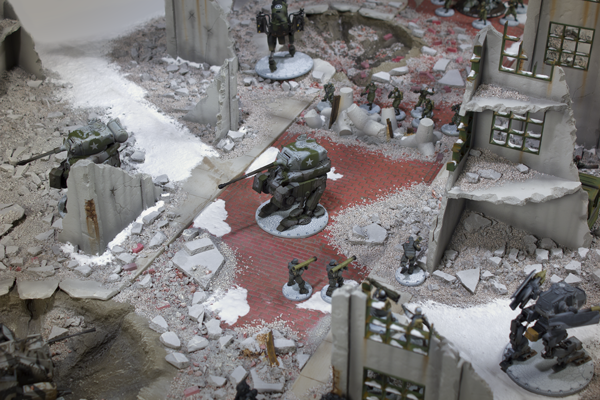 Currently in beta, this tactical tabletop miniatures game of alternate 1940s reality World War II combat will demo throughout Gen Con Indy 2011. The year is 1947, and World War II still rages, fueled by the discovery of alien technology. The world’s superpowers have developed unprecedented weaponry, including lasers, phaser cannons, and massive combat walkers. These war machines stride across the battlefield, protected by their heavy armor, and devastate enemy troops with their fearsome cannons. Dust Warfare players assume the roles of generals, each commanding a custom-built army of squads, walkers, and heroes. Draw upon Axis might or Allied versatility as you wage ferocious battles for control of the rare ore, VK, needed to fuel the most powerful of the superpowers’ weapons. 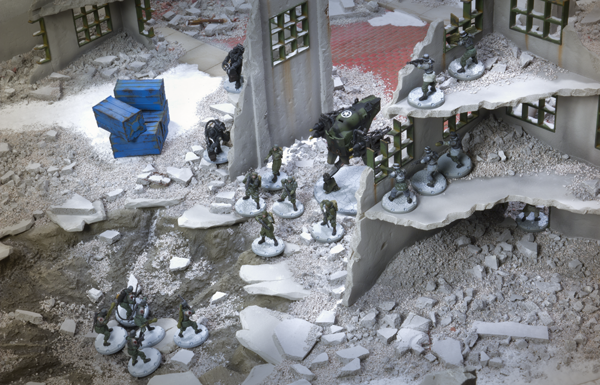 Dust Warfare players build armies from the exact same set of miniatures as Dust Tactics. This means that if you already own a Dust Tactics army, all you need is the Dust Warfare rulebook. All the stunning Dust Tactics miniatures will be useable for Dust Warfare immediately upon its release, and as both games go forward, they will continue to draw from the same wealth of fantastically detailed miniatures. Current fans of Dust Tactics will recognize the furious combat, strategic scenarios, and gorgeous miniatures. Players new to the world of Dust are in for a treat. 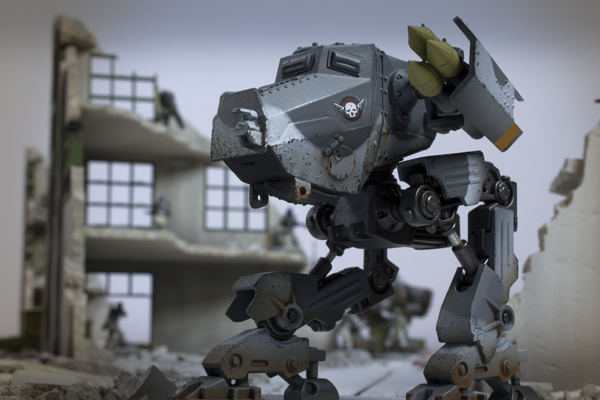 Dust Tactics introduced rules for fast, intense combats featuring combat walkers, bazookas, flamethrowers, and lasers. 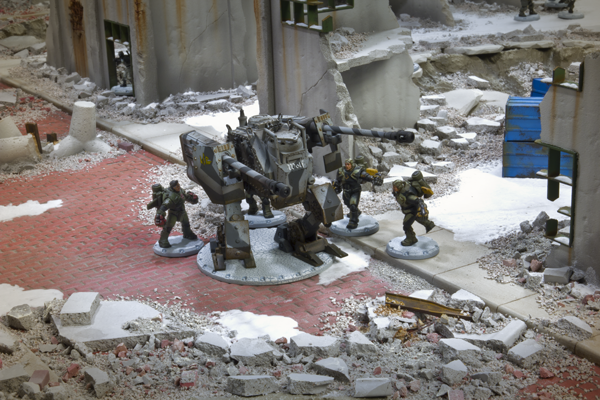 Dust Warfare builds upon the board game’s rules and strengths to offer players an exciting new game experience with the tactical and strategic challenges of a tabletop miniatures game. Fantasy Flight Games has exciting plans for the Dust Tactics and Dust Warfare lines, and players who pick up Dust Tactics miniatures find their new units immediately useable for play in both games! 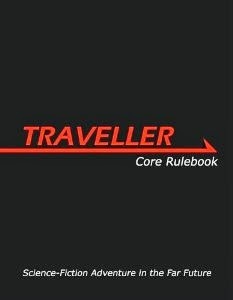 Designed by Andy Chambers, the Dust Warfare rulebook introduces unprecedented player engagement. Players first get drawn into the action during the Command Phase, where you have to choose how to spend command points during an escalating battle. You might spend command points early and often to advance and sustain an early lead, or you might save them up for dramatic late-game effects that may decisively turn the tide of battle. The Command Phase presents players with the chance to exert their influence and command style upon the field of battle in an engaging new way. Players have the chance to activate all their forces during the Unit Phase, and reaction mechanics keep you fully engaged throughout your opponent’s turns. As enemy units close in on yours or begin to open fire, you can choose to spend actions from your next turn to react. Keen commanders will make good use of their reaction options. They will also learn how best to feint and bait their opponents to react, draining them of available actions. As the battle heats up and casualties mount, you need to keep a sharp eye toward your army’s morale. The constant barrage of enemy fire can suppress your units or even force them to retreat. You may try to lay suppression fire even when you can’t destroy your enemy’s unit. Sometimes, just pinning them down can give you the edge you need. ...Dust Warfare is scheduled for release in the fourth quarter of 2011. A couple of funny instances have happened to me recently. I frequently wear my official "Keystone Gaming Society" shirt around (it's a nice shirt!). I had two people notice it and make comments about it. The first person asked if I worked for the state managing casinos or the lottery. How funny! They thought that "gaming" meant "gambling!" I had to explain that "gaming" meant playing board, card, and role playing games, that no wagering was taking place, and that, no, I do not work for the state. In a different place at a different date, the second person asked how I was involved in sports. I realized that, once again, somebody had read my shirt incorrectly - "gaming" does not refer to sporting events! I explained that I was a part of a blogging website that discussed and reviewed games. They looked a little less interested when they learned the true meaning of "gaming...."
As a promised, following up my post Gaming Aide #1this post, Gaming Aide #1c, is my third in a line telling everyone where I've put my tab in some of my most used game books. Eclipse Phase is a near future sci-fi roleplay for the experienced gamer. To me it lending itself to the long term campaign, push's the boundaries of sci-fi and horror while giving the player the ability to move his character from body to body. This trans-human genera will most likely step you out of your comfortable sci-fi zone to a harsher more real feeling future. The Eclipse Phase book needs tabs! If your a player you going to need a book so you can read up on the background and to have access to all the things you'll want/ need to know to play and your going to need to tab those pages! For us referees your going to find the referee screen to be incredibly helpful one minute and yet incredibly useless the next and so your going to need your book tabbed to fill in for all the other stuff you'll need to reference during play. If you've read my other 2 posts about tabbing you know this disclaimer already! One thing to keep in mind about my list is that my books are tabbed for my use as a referee not a player. Here and there you'll find me marking a page for my players but not to often. So as a player in Eclipse Phase game you'll want most of these same tabs along with the tabs for your morph, weapons, gear and any other things that you end up using all the time. An amazingly small number of tabs for how much I used the book during our 4 weeks of our playing it. During our Eclipse Phase podcast I mention a book that I used to help people understand the concept of copying your consciousness into another body. This is a common theme in EP and an important idea to have a solid grasp on when playing the game. The 4 pages you want to read are all that is of Chapter 2. "from the moment the synthetic body is activated, there will be two of you-two entities who each feel they are you. ...In your own mental picture of yourself, which one do you consider the real you: the one that suffers aches and pains, the one that has trouble sleeping through the night, the one that is frail and old? or the vigorous you, the you in full possession of all your mental and physical faculties? 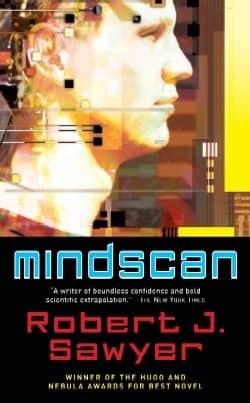 ...the human mind is nothing but software running on the hardware we call the brain. ...consider the fact that the atoms that make up your body are completely replaced every seven years: there's not one bit of the you who was once a baby that still exists; it's all been replaced. I'm sure that even by my few quote's you now have a better idea of the concept. So the only question is when can we start actually doing this?! I mean, I might not be able to go on but I know that my copied self would want to and what if we could have a copy of those we know and love around long after they died?! 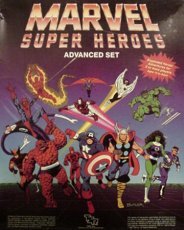 The heroes defeated the Marauders in downtown Omaha in search of Mr. Sinister's base so they can rescue the kidnapped baby, Nathan Summers. Angry crowds gather around the street-clothed heroes and the villains they just defeated. Devastation surrounds them in the aftermath of the battle. Two cops are calling in reinforcements but the mob surges forward, chanting anti-mutant phrases. Rocks are thrown at the unconscious Marauders by a few irate rioters. The situation is quickly spiraling out of control until Wolverine steps forward and calms the crowd. The mob disperses with some interested onlookers lingering to see what will happen next. Cyclops and Colossus enter the orphanage in search of Mr. Sinister's base, which they believe to be under the orphanage. Finding the orphanage empty, they go to the basement where they hear sniffles and children crying. The children are huddled together in the basement with the orphanage staff trying to sooth their fears as best as they can due to the loud, destructive fight that just occurred outside the orphanage. Cyclops tell them the danger has passed. One of Cyclops's old orphanage guardians from when he was a child at this orphanage recognizes him and agrees to let me look around the orphanage. Their search is fruitless - it turns up nothing. Meanwhile, outside more police show up and rope off the crime scene. Freedom Force, the mutant government team, has been called to take the evil mutants into custody. Wolverine catches Marvel Girl saying as she calls Nathan "her baby," when, in reality, it's Madelyn Pryor's baby. He confronts her but she dodges the question. A blind lady in the crowd catch's the Beast's eye - it's Destiny from Freedom Force. She warns him, "Beware the red death. It's an end to all mutants. Stop the coming Apocalypse!" then disappears back into the crowd. Knowing that the rest of Freedom Force can't be far behind, the X-Men redouble their efforts to find Sinister's base. A search of the exterior of the orphanage and the sewer turn up nothing so in desperation, the X-Men have Jean Grey read the mind of one of the Marauders, Scalphunter. They discover that their is a dimensional portal nearby that is activated by a device the Marauders have. Jean lifts the device and they proceed to the nearby door. Upon entering, they are transported to a long, dark corridor with a large, bright room at the end. "Welcome, my brothers!" Mr. Sinister greets them warmly. A force field prevents them from attacking Mr. Sinister and Dazzler, who is with him holding Nathan. Mr. Sinister and the obviously mind-controlled or possessed Dazzler explain their master plan to the X-Men: They had to have the Morlocks killed to weed the mutant gene pool of those unworthy. Sinister claims that the Morlocks were created by somebody else using his technology. He explains how he has manipulated Cyclop's, Jean's, and Madelyne's lives so that Nathan can be born - the mutant he hopes will grow to be capable of destroying the ancient, evil mutant - Apocalypse. 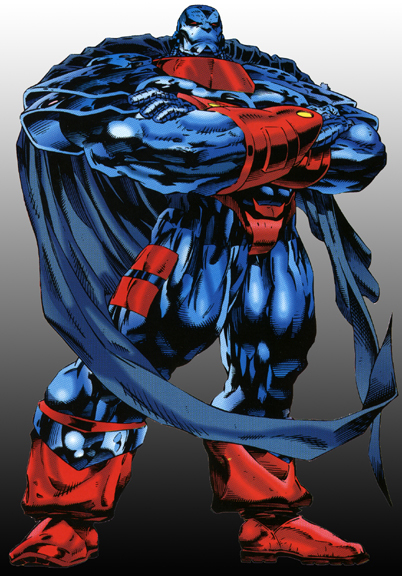 He reveals that Apocalypse most likely has their missing teammates (Rogue, Sunspot, Magma, and Angel) and that he desires to rule the world. He doesn't know where Apocalypse is, but he is guessing that the one who stole his technology to create the Morlocks does. Sinister has Dazzler return Nathan to the X-Men saying, "I have what I needed," before disappearing. Mr. Sinister's tesseract base starts collapsing and the X-Men struggle to get out. Uncharacteristically, Marvel Girl seems reluctant to save anyone except Nathan. Finally, she does but once outside Dazzler hands Nathan to Marvel Girl and both of them start walking away. The team pursues Marvel Girl and after Cyclops strikes her with an optic blast, she reverts back to her normal self. It seems Madelyne Pryor had taken over Jean's mind when Jean had made mental contact with the comatose Madelyne earlier. Freed from Madelyne's influence, a weakened Jean flies back to the X-Mansion with the rest of the X-Men. Jean stays behind with Nathan and Psylocke at the X-Mansion while the rest of the X-Men return to the Morlock tunnels in search of the one who can lead them to Apocalypse.